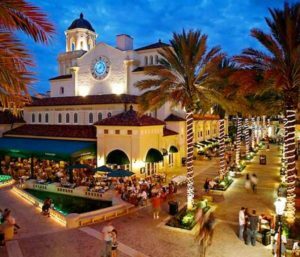 CityPlace is comprised of 600,000 square feet of retail businesses, over 20 restaurants, a 20-screen theater, open-air plaza, cultural arts theater as well as hundreds of private residences. Come shop in a place where old-world architecture, beautiful fountains, and sidewalk cafes create an atmosphere strikingly reminiscent of a European town center. The Kravis Center for the Performing Arts borders the west side of CityPlace and walking north on Rosemary Avenue will take you straight into the Historic Clematis Street area. Below is our CityPlace Business directory. Click here for a map of CityPlace. Take the FREE Molly’s Trolley with pick-ups every 10-15 minutes throughout downtown West Palm Beach! Note to CityPlace businesses: You may add, delete or amend your business listing by contacting WestPalmBeach.com here. Schedule & Tickets Revolutions: Eat, Drink, Rock & Bowl.